Some of you may have seen the original version of this tutorial that I did last year and although it has over 1 million pins on Pinterest, I wanted to redo it with a little better instruction. 1. Braid your hair into several braids. I have pretty thick hair and only needed 6 braids. If you have thin hair, maybe try 4 braids. I just used clear elastics to secure the braids at the end. 2. Loosen the braids A LOT. I made mine as flat as possible. It was like a thin sheet of braid. 3. Starting from the top of the braid, clamp your straightener down. Hold it in place for a second and then open it up, move it down and clamp again. Repeat until you reach the end of the braid and then repeat on all braids. 4. Once the braids have cooled, spray with hairspray if you have some that you like. Then unbraid all of your braids. 5. Run your fingers through the braids to loosen the waves and do a quick tease with your fingers at the root of your hair to create some more body. And that's it! I really like the soft wave that this creates. They are like hippy-esque waves. Like I need to put a headband around my forehead. And it's simple. Enough. Said. I'm going to have to try this when I get ready for school this week! My daughter calls this mermaid hair...love it! That's so pretty! 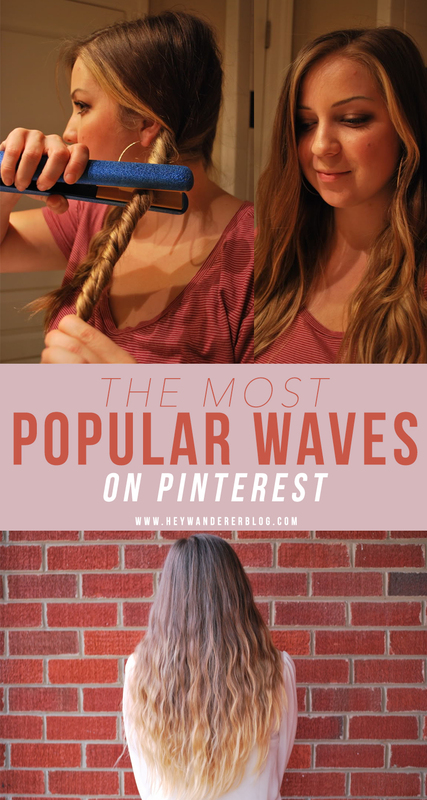 My hair will never wave properly, will definitely have to give this a try!